How can I ensure compliance for my customers that use the OCU Checkout? Go to Settings > Page Defaults > Checkout Page and click the "Customize" button there. In the "Appearance" section of the Checkout Page editor, we have added a GDPR Checkbox and GDPR Accepts Checkbox Label to collect consent from EU and EEA customers to store and process their data. The GDPR Checkbox setting is enabled by default. You can hide this checkbox and message by clicking the switcher for this setting to disable it, but it is strongly recommended to have it be enabled for your EU and EEA customers. Note: If enabled, this checkbox will only show for customers which are detected as being from countries belonging to the European Union (EU) or the European Economic Area (EEA) based on IP address. GDPR Accepts Checkbox Label - Default text is provided. Use this field to add your own text for the GDPR checkbox message if desired. Where will the GDPR checkbox and message be shown to EU customers on the OCU checkout? 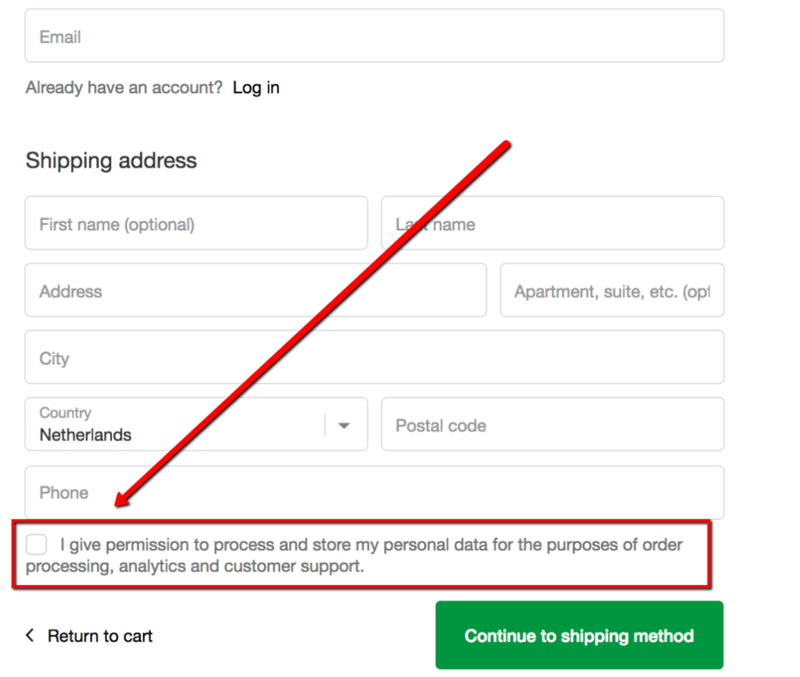 The GDPR checkbox and message will be shown to your EU and EEA customers directly below the "Shipping address" section of the first step of the checkout. This placement is important since it's required to collect consent prior to proceeding any further. If this checkbox is not clicked, the customer will not be able to proceed to the next step of the checkout.